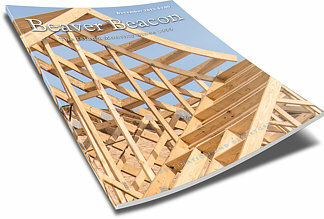 Ron Wojan - General Contractor Inc.
B & Z Well Drilling Co.
Beaver Island: A Great Lakes Jewel has been nominated for a MI Emmy! If you're on a broadband connection, you can view the video online. 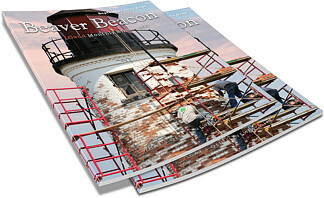 The Beacon is proud to be a member of the Beaver Island Chamber of Commerce. 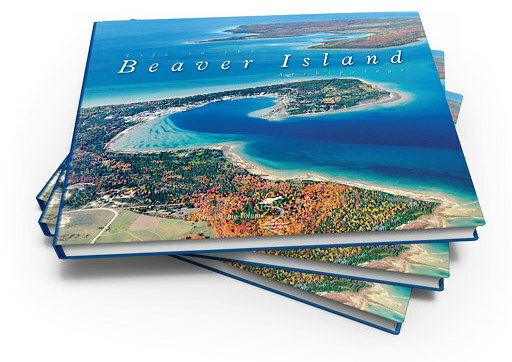 With 208 large pages of lush full-color photos and interesting facts, the hardcover Beaver Island book Life in the Beaver Island Archipelago has appeal for everyone who loves the Island. 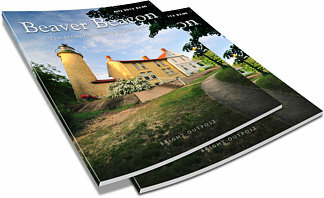 Its mix of hundreds of photographs of Island scenes and stories combining amusing anecdotes with historic facts makes it something to turn to, time and again. 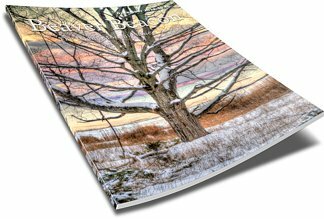 Blending the first decade of the 21st century into a single year, it depicts the shifting seasons, the shifting shades the forests, the arrival of soft, blanketing snow and the freezing over of the lakes, and the blooming of a progression of flowers. 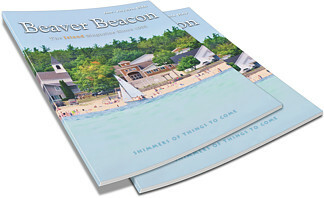 It builds toward the burst of summer activity, the arrival of pleasure craft, private planes, and, most of all, people — what for Beaver Island constitutes the cycle of life. 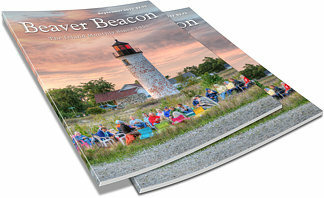 Pick up your copy from the Beaver Island Community Center, the Beaver Island Historical Society, McDonough's Market, Livingstone Studio, Island Energies, Shipwreck Shirts, or the Toy Museum. When you cannot be here in body, at least you can be in spirit! Doe Hunting ... be selective please! What the heck ... about Asphalt!? Who were, and almost were, our Citizens of the Year? How many cars is enough on Beaver Island? Spinning the end of a tale 28. How much Ice? How much Time? Lawrence's "Best Birthday in 50 years – at least!" St. James Millage Results: Yes to Fire Protection, Road Construction and Maintenance, and Health Center Operation. "Gently Used, Barely Used, Like New"
BICS Teacher Miranda Rooy selected to represent the teaching profession in Washington, D.C.
Could Paradise Bay see a Paddle Festival? What's that Old thing worth? Oil on the Shores of Beaver Island? When something goes wrong – It Takes A Team. The fast response to the Emerald Isle's engine failure. What is this voracious beetle? Behind the purple triangles. 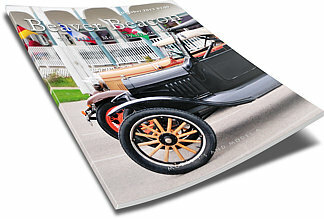 A summer of events - from the Bike Fest to Museum Week, The Music Fest to Baroque on Beaver, new films, art shows, vintage vehicle parades, and the Crankun Ts. Watch out for these invasives! "It's a long way... to Beaver Island." "There's no such thing as a free lunch" proved wrong. Charlevoix County Community Foundation grant given to the Beaver Island Food Pantry. 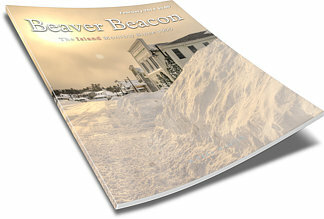 "Because we are a family"
Beaver Island's Community Center Receives Special Gifts in 2012, Giving it Many Happy New Years! Wanna Monkey around (with a survey)? The County Garage – is it coming? The Taylorcraft Project – code name "Big Red"
Photos from D.J. Angus' trips to Beaver Island, MI ca. 1951. Grand Valley State University Digital Collections. The amazing song John Hett wrote in 3 days about the fatal locomotive crash that killed engineer David Chase in 1908, a moving ballad as good as anything by Nick Cave, is now on YouTube. St. James Marine's Tug Wendy Anne tows the historic 350' SS Keewaitin from Saugatuck Michigan to Port McNicoll Canada. Click here for more photos and video, and a link to the 9&10 News video if you missed it on 6/6. Thanks to Jeff Powers for the photo above. 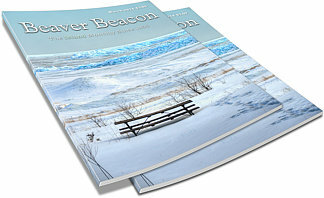 Full story to appear in the July Beacon. A great setting in the woods off the West Side Road. Neat bands. Radiating rhythms. What more could you want? On Thursday night some impromptu sets and Joddy's slide guitar warmed things up between scheduled bands as some of the bands and many attendees to the music fest were delayed when a small pleasure boat collided with the Emerald Isle in the channel off Round Lake in Charlevoix. The Coast Guard had to perform an investigation, but a few hours late the boat finally made her way to Beaver, undamaged. And the night was just getting started. Hundreds of people, possibly every man, woman, and child on Beaver Island, came out on Sunday July 3 for the formal dedication of the beautiful new Veterans Memorial park on Beaver Harbor. 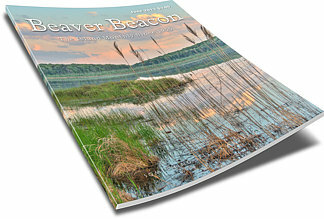 Interested in spending a winter on Beaver Island? Take a few minutes and watch the neat time lapse movie Bob Tidmore created and has now uploaded to YouTube. "It was taken over the 2007-2008 winter and consists of individual photographs taken every 10 minutes out of our upstairs front window (OK maybe I missed a couple of days here and there) less the ones taken at night... 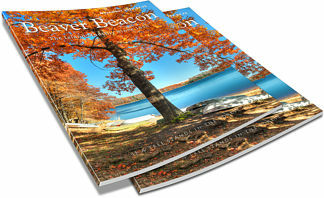 Enjoy"
The Second Annual Fresh Air Aviation Winter Fest on Lake G is scheduled for Saturday February 19, 2011 from 12pm - 4pm. Lots of Ski Flying, good food, good friends, and games for all ages. 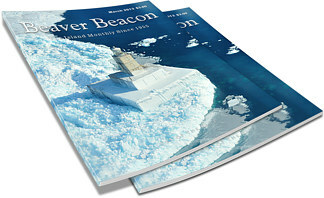 Have a look at this Video created by Mike Hurkmans during last year's Winter Fest on Lake G.
Another neat video on youtube: A classic flight to Beaver Island in the Sikorsky Flying Boat, from Island Airways. Members of the Beaver Island Comedy Group worked as hard as Santa's elves, creating brand new skits and videos for the Holiday Hilarity II production! If you missed the show at the Community Center, check out the clips on YouTube! Some of Our Favorite Christmas Lights... from 08... Beaver Island welcomes the newest tug, the Wendy Anne. 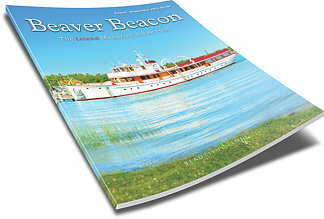 Photos and story of the tug and journey from the east coast to Beaver Island appeared in the November 08 Beacon. Also photographed lighting the harbor for the holidays. The Return Trip - James Kenwabkisi in the Ruby Ann breaks out from the point through 16" ice to re-open the harbor for the Emerald Isle's return trip with Bud Martin on the ice ready to chainsaw when needed. 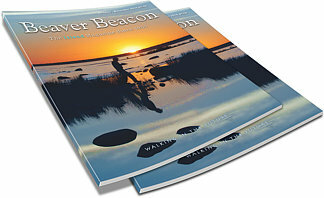 Full story and photographs in the April Beacon! In Route to Whiskey Point - You've never seen the Ruby Ann here before! On a flatbed trailer in front of the Harbor Light waiting to launch into a chainsaw cut berth in the ice. The Biscayne Bay clearing the harbor with her side bubblers pushing ice out from the hull. Passing Whiskey Point required one or two back-downs, but was in general a smooth operation after the long day reaching Charlevoix. 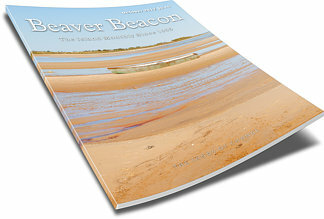 Many pictures from Charlevoix, Beaver Island, and the air in the April Beacon. 69 people on 6 boats took part in this year's Beaver Island Archipelago Challenge. Boats were stationed around Beaver, Garden, and High Islands to give out cards. 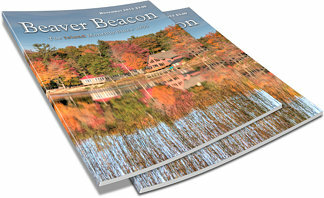 Proceeds benefited the Beaver Island Community Center. If you didn't get a chance to take part this year, watch for the dates for next year's event. Enter your boat in the 4th of July Lighted Boat Parade - Help light up Paradise Bay at Dusk on the 4th of July sixth annual Clyde Fogg Memorial Boat Parade. 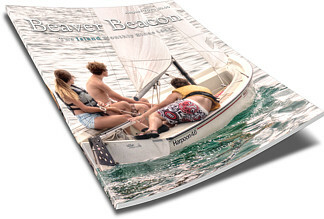 For info, call Mike Weede (Home) 231.448.2708 or at the Paradise Bay Dive Shop 231.448.3195. Trophy for the best boat! Get ready for the Beaver Island Bike Festival - June 26, 2010. See the website for details and registration information. A Video commissioned and directed by the Charlevoix DDA of the new East Park Charlevoix. YouTube Find: History Detectives Spoof -- The Buried Treasure of Beaver Island. Thanks to Brendan for the link! Christmas in July? Almost. June 30 and July 1 at the Community Center. It’s once again time to purchase your tickets on the B.I. Rural Health Center’s annual car raffle. This year’s vehicle is a very attractive 2010 Crystal Red Metallic 2010 Chevrolet Cobalt. Beaver Island Veterans Memorial Park - "Construction started at 9:00 this morning 7/6/2010 with the ground breaking by Carl Felix. Jimmy Wojan is providing the landscaping and earthwork for the project. We'll be posting more pictures as the park progresses. Honor a vet and purchase a brick." 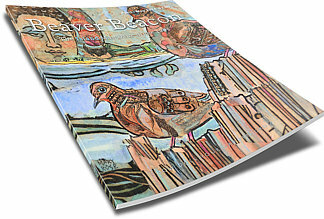 Baroque on Beaver - made in Michigan and featuring favorites Claudia Schmidt, Martha Guth, and more! Don't miss the Beaver Island Music Festival July 15 - 17, 2010! 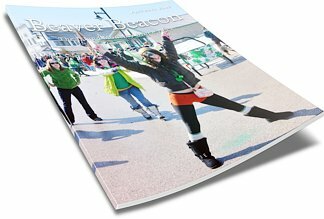 Click here for this year's Festival! Ken Bruland's 85-mile solo kayak trip to benefit the Beaver Island Food Pantry. Help Ken gear up for the trip by being one of his sponsors. And help the cause by donating to the Beaver Island Food Pantry - jars at McDonough's Market, The Station at 4-corners, and The Beaver Island Community Center. Waugoshance! A photograph of Ken heading for Waugoshance point by Frank Solle and thanks to an Island Airways Flyover. Please consider donating to the Food Pantry / Paddle for Food so Ken's long paddle fulfills the hopes to support this good cause. 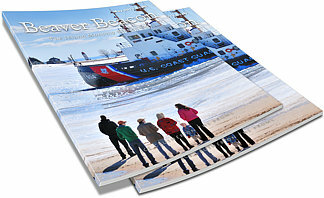 Harbor open for the season - to start April in spring-fashion, the USCG Mobile Bay returned to the Island to open the harbor so the ferry can begin her season. Photograph by Frank Solle. 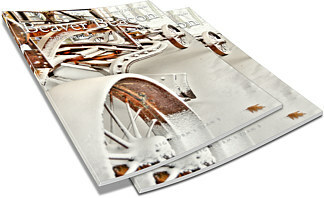 Livingstone Studio's Meet the Artists will take place July 31, 2010 12 noon to 4 pm. Shipwreck Diving - Mike and Gail Weede will present another thrilling episode of diving on the Island’s shipwrecks such as the Niko. Music on the Porch - who will perform this year? Could it be you? The Yankee Lady B-17 touched down at the township airport. It's up - The three new 180' E.W. Marine towers, on the Font Lake side of Donegal Bay Road, at the East Side Fire Station, and at Greene's Lake, are now up. 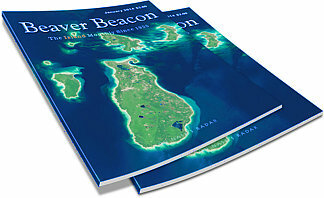 Photographs in the May Beacon! Pinky Lee on NPR - Beaver Island's Jenny Bousquet and Holly Keller have been playing music together for the past year, writing songs about family, love, and seasons with a folky, soulful style. Both women play guitar and mandolin while singing unique vocal harmonies. March 15 2008. The Beautiful New Beaver Island Community School now complete.